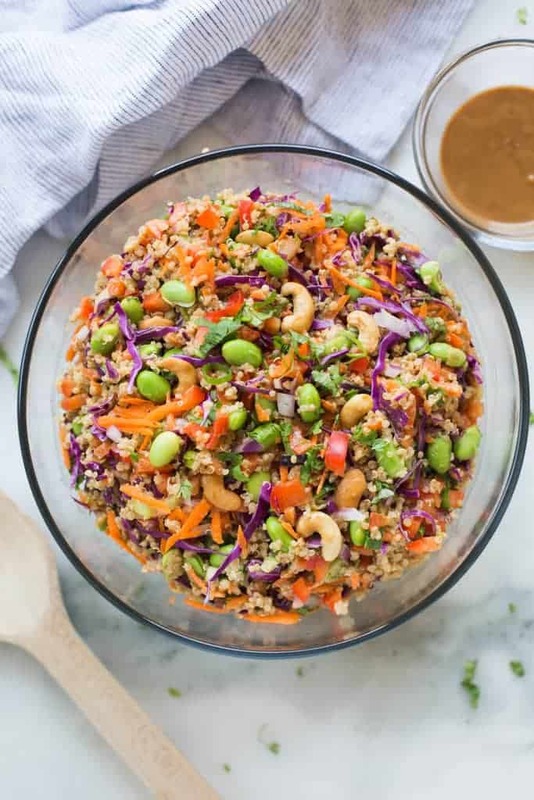 Quinoa tossed with a medley of fresh, crunchy veggies and drizzled with a delicious peanut sauce. 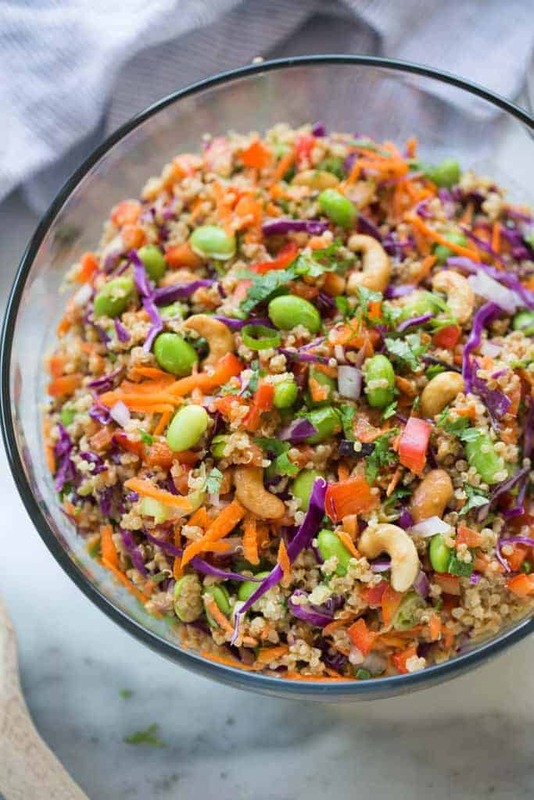 Everyone always loves this fun and delicious and easy Thai quinoa salad. 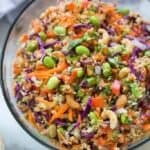 This Thai Quinoa Salad has been a favorite of mine for years! I first shared this recipe in January 2014, and, even though it already has great reader reviews, I thought it was in desperate need of being pulled out of the archives for those of you who haven’t tried it yet! 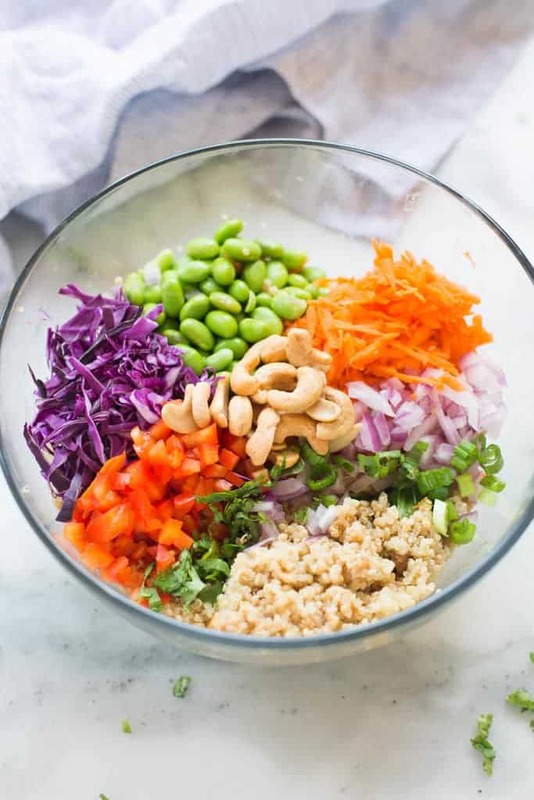 Not only is this Thai quinoa salad recipe healthy, fresh and tasty, but all of the different colorful veggies make it beautiful, too. Red bell pepper, purple cabbage, onion, carrots, edamame, cilantro and green onion–wow that’s a lot of veggies! A great tip to make this recipe even easier is to chop all of the veggies the day before. Also, cook the quinoa the night before so it can cool in the fridge. You can also make the peanut dressing several days in advance, if you want. Store it in an airtight container, in the fridge. Add the dressing to the salad gradually, to taste. You may not want to use it all. Also, I wouldn’t add the dressing until right before you’re going to serve the salad. And my last tip: save the cashews until the end, right when you’re ready to serve, so that they stay crunchy. Quinoa tossed with a medley of fresh, crunchy veggies and drizzled with a delicious peanut sauce. Everyone always loves this fun and delicious and easy quinoa salad. Cook quinoa according to package directions. You should have a little over 2 cups of quinoa. Add peanut butter and honey to a microwave safe bowl and heat in microwave for 10-20. Stir until smooth. Add in ginger, soy sauce, vinegar, sesame oil, olive oil and sriracha and stir until smooth and creamy. If necessary, thin the dressing by adding a little more olive oil or some water. Taste and add more hot sauce, if desired. Drizzle half of the dressing over the cooked and cooled quinoa. Toss to combine. In a large bowl combine the red pepper, onion, cabbage, carrots, edamame, and cilantro. Fold in the quinoa. Add as much of the remaining dressing as you'd like (to taste). Add cashews and garnish with green onions. Enjoy. 6 WW points. Going to try it tonight. I made this tonight & it is delicious! The only thing I added was the zest & juice from 1 lime. Thanks for a great recipe! I will be making this again & again! I made this for a family gathering this weekend (trying to bring something healthy to the table). It was the second time I made it and I really enjoy it. I did just want to remind myself the next time I make it that I want to reserve the cashews until I am almost ready to serve. I made it the day before and the cashews got softer than I like (otherwise I thought it was fine to make it ahead). That’s a great tip to reserve the cashews until the end! Glad you liked it! Thanks for commenting! I made a few changes because I bought red quinoa so to ajust the colors I used green cabbage, sweet frozen thawed corn instead of the red pepper, macadamia nuts instead of cashew because thats what I had. Everything else was the same .. i did add more salt and some lime juice. Hubby loved it and so did I. Delish ! This was a delicious salad, will definitely make it again! Yummy!